Under the Arcade with Butch Husky: Tinkering around the edges. Let's get down to brass tacks, this is the one we'll probably see more often than not. I'd like to move Posey out of the cleanup spot. The pressure to produce is too much of a burden for a catcher of his caliber, on whom so much already depends. But he's the most reliable run producer Bochy's got, so there he stays. The hope here is that Pagan and Sanchez get on base and give the Big Three a chance to put the G's on the board. And if Huff, Nate, or #ProfessorStamos run into one, or they combine for a couple hits and a run, all the better. Like everyone else – and especially Huff – we all want the Huff Daddy back. He needs to bring the boom stick in 2012 to make up for his forgettable 2011. So, the thing is, there's really no way Bochy can sit Melky given the wet noodle that is the offense as a whole. Even if he struggles, I don't see the boss suddenly running Belt out to left field every day. So He'll drop him in the order, let Pablo get back to his natural role in the 3-hole, and hope that Melky figures it out. What could alter that fate? If Belt comes out of the gate swinging, he'll earn his time. 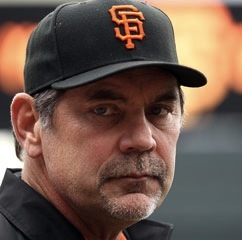 It's not rocket science, because Bochy's not a rocket scientist. He's a ballplayer, and he thinks like a ballplayer. He wants to win. So if you don't hit, you sit. This is probably closer to the lineup most of us want to see, and were it not for 11 million reasons we don't need to discuss now, we'd likely see this lineup on most occasions. But it's still a possibility. If Huff limps into camp an even slower shell of a man, and Belt really lights it up from start to finish, you could see a platoon as early as Opening Day. But even if he doesn't win the spot outright, I don't see Huff getting a longer leash than one month. If he's not back to 2010 form by the end of April, I'd hope to see more of Belt at first. Relax, I only have Brandon in the 7-hole because Huff makes more money, and I didn't like the idea of them going back to back. Again, something Bochy would do, eh? Look, over there, a taco! But seriously, let's get serious. This is a lineup that has some serious pop potential. (That's a new stat I just made up.) And when I talk about "pop", I'm not referring to Coca-Cola™. There won't be many times in 2012 when the Giants will rely on the long ball. The three-run jimmy jacks will be few and far between. As will the Splash Hits. So cherish every homer, kids. You never know when you're gonna see another one. 'Nuf said, right? This is the thinking-outside-the-box model. There are some guys that just have to be in there every day, and there are times when Bochy can let it all hang out, and those are the days when the fifth starter takes the bump. Now, these are just a few of his options. Let's not forget that Burriss can play the outfield, Panda can catch or play first, Huff can play left, Melky can play any outfield position, and Brett Pill can come in off the bench for some right-handed strength. 5 Uh, what's his name? And that's why the payroll and roster are set in mid-December. When you have a strength, you have to pay to keep it around. So there will be big deals for Lincecum and Cain. And why not? There's a reason all of Sabean's colleagues keep inquiring about them. Who wouldn't pay top dollar to have those horses at the top of the rotation? I'm not afraid to agree with the brass in thinking that a healthy offense will produce more runs, and more wins. I think the team as constituted will perform far better and achieve far more than the doomsday naysayers out there. That doesn't make me blind to the team's faults. It just makes me a fan.